Jose Maria Lopez's career has been split into two halves - one in single seaters and the other in touring cars. 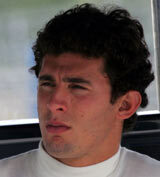 After karting the Argentine moved to Europe aged 18 to race in Italian Formula Renault. He beat Robert Kubica to the 2002 championship in his second year of competitive racing, taking four wins along the way. The successes continued to roll when he clinched the Formula Renault V6 title the following year - his last championship victory in single seaters. His performances earned him a place on Renault's driver development programme and in the December of 2004 he was offered tests at both Renault and Minardi. Although his times hardly set the world alight, it was enough to warrant a race seat in F1's feeder series GP2 for 2005. A win in the second round sprint race in Spain raised expectations, but they were never met as mistakes and unreliability ruled out a serious challenge on the title. In 2006 we was recalled by Renault and offered a full time testing seat, completing a series of seven tests interspersed by another GP2 campaign. Again, retirements dogged his season and by the end of the year he found himself without a drive as money dried up and, at 23, he was pushed out of Renault's driver development scheme. He returned to his homeland and competed in the TC2000 national touring car championship for 2007. He won the series at his second attempt and then tried his hand in the FIA GT series behind the wheel of a Ferrari 550. But before settling into a career in touring cars, a deal with US F1 looked set to thrust him back towards single seaters, although the team's demise before it turned a wheel put an end to his F1 dream. He is consistent but has never shown the outright pace to set him apart from the field. A series of tests for Renault is still his main selling point, but he didn't impress as much as Heikki Kovalainen and lost out on a race seat in 2007 as a result. Returning to Argentina to race in touring cars after failing to shine in GP2. "US F1 is a new team, starting from scratch, something different from what I experienced in Renault, where the structure had many years of experience." On his first Renault test: "I was feeling lots of different things: happy, of course, and a little bit of emotion, because I was achieving a dream." His nickname is Pechito, which directly translates to "little chest" in English.